Simply Silver Sterling Necklace Stunning Blue Diamond Pendant. New with tags. Original RRP is £25 Would make a wonderful gift. This is a beautiful rose gold ladies pendant necklace, featuring the very best Austrian sourced AAA quality Cubic Zirconia diamond stone. Jewellery Sets. Stones: Cubic Zirconia (catches the light beautifully). This necklace can be given from daughter to mother, Mother to daughter, Father to Son or from Son to a father, Niece to Grandma or vice-versa. 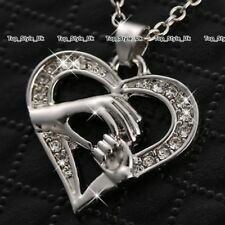 We will include a Free Gift bag with the necklace. There are15 number of 1.5mm clear crystals on the necklace. GENUINE 925 Sterling Silver Round Cubic Zirconia Stud Earrings 4 Sizes Women UK! They are bonded with a thick layer of real, 18 carat gold and display flawless Swarovski zirconia gemstones. These stunning earrings, from CRUISE of London, have been skilfully crafted with real, 18ct bonded gold, lab created stones and glittering Swarovski Zirconia. The length is 26mm from top to bottom. These real 14k rose gold filled earrings. Your fabulous earrings will be presented in a luxury gift box and gift wrapped. Goldfilled is athick layer of gold, which ispressure bonded. Gold filled is much more valuable and it does not flake off, rub off or turn skin green. Gold Filled: Gold filled must not be confused with gold plated. Gold filled is a thick layer of gold, which is pressure bonded. Gold filled is much more valuable and it does not flake off, rub off or turn skin green. This 'S Links' bracelet is 18cm / 7.25" long and 6mm. glittering simulated diamonds (Swarovski zirconia) and 20 tiny round ones. Do get in touch if you need further information or help. There are20 Number of 1.5mm Clear Crystals on pendant whichsparkles and shines beautifully. We will include afree organza gift bag with the necklace. Thisgold plated pendant features a dainty heart holding large heart with8mm Crystal Diamond. This is a beautiful ring from the Hollywood Collection at QVC. All the Hollywood Collection jewellery was based on the sumptuous pieces owned by the stars of yesteryear. The original of this ring was a piece owned by Barbara Stanwyck. Simple clasp to open and close. Material: 316L Stainless Steel. Color: Rose Gold. Amazing on the wrist and simple elegant style. Style: Round Accessorise. This pendant and chain is bonded with real 18ct white gold. The pendant has a beautiful Swarovski crystal centre, surrounded by glittering simulated diamonds (cubic zirconia). See also the information in the "specifics" above. The chain is 18" / 45cm long; the pendant is 4cm long, including the bale, and 2.6cm wide. They are perfect for all of those special occasions - or even to turn heads at work! If you need anything else. SAVE MONEY. Gold filled is a really thick layer of gold, which is pressure bonded. Gold filled is much more valuable and it does not flake off, rub off or turn skin green. but at a fraction of the cost!". All designer earrings, from CRUISE of London, have been skilfully crafted with real, 18ct bonded gold, glittering Swarovski Zirconia and lab created stones. It is our pleasure to let you happy and satisfied. GULICX Jewelry. GULICX is a manufacturer who focused on producing fashion jewelry for over 10 years. We have the professional teams to choose the best Cubic Zircon and Sterling Silver. New Genuine Thomas Sabo Sterling Silver Diamond set snowflake/star Angel Charm DC0019-153-14 £80. This included ensuring watch batteries are in working condition. This pendant features a largegold heart, mini sparkling crystals heart and infinity symbol whichsymbolises never ending love. Included: Free organza gift bag necklace. We will include afree organza gift bag with the necklace. This bracelet is 7.4" (18.4cm) long - and 5mm wide. for beautiful things. Stunning 2ct Cubic Zirconia Heart Ring Size M.